Evaluate the sensitivity of your dog to loud noises first. By living every day with our four-legged friend, we have the chance to observe its behavior and reaction to noises. When walking on the streets, it sometimes happens that suddenly a car door slams loudly, a shop gate is pulled down or a horn is honked near us. Although it is normal for a loud and unexpected noise to make us both jump for scare, we should check if after that behavior returns to normal or the dog remains intimidated for some time later. Not all sounds have the same effect on the each individual, as they have different frequencies and intensities, and can trigger associations in the dog with other negative experiences experienced simultaneously with the perception of the sound itself, but it is likely that a dog suffering from these noises is also sensitive to fireworks. For this reason it is always advisable, at the first New Year’s Eve spent together, to celebrate with your puppy at home observing how it behaves and acting – where necessary – according to the guidelines listed below. 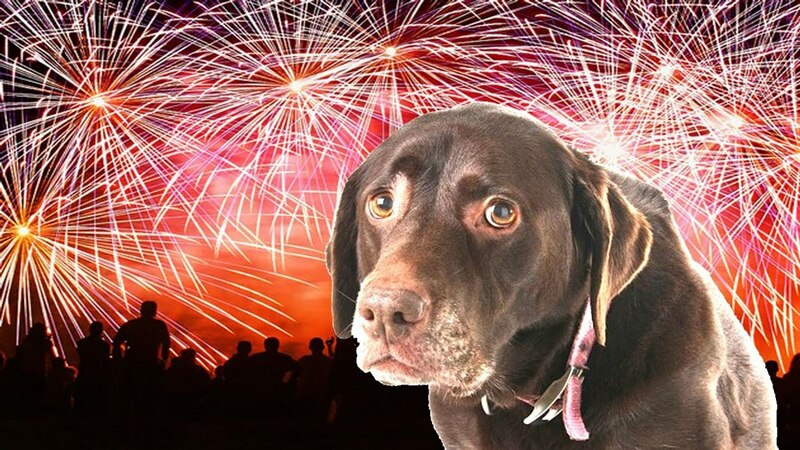 If you have to go out, be careful to avoid the crowded areas or points where fireworks shooting is more frequent: even dogs who are not afraid can be traumatized by a bang too close to them, and therefore remain intimidated in the future. Always be close, trying to keep it calm with voice and touch: our close presence is always the greatest comfort. Stay at home with the windows closed and with loud volume of television or music: by this way, even bangs near our home will be less audible. Provide small, protected areas where your dog can shelter: sensitive dogs often find comfort in hiding themselves under tables and chairs, or in limited areas of the house where they feel safer. Leave them quiet in these shelters if they do not show signs of excessive stress (panting, trembling, drooling et cetera). It is proven that by applying a specific pressure in certain well-defined points of the body of the dog we can reduce its sense of distress. Special dog T-shirts developed according to the Tellington TTouch principles are available in the best pet shops and by exerting a targeted pressure once worn, these shirts can greatly alleviate the stress caused also by the fireworks. The use of Dog Appeasing Pheromones (available in the specialized pet shops in form of tablet, collar or home diffuser) may contribute to reduce the sense of anxiety and to make your dog feel more comfy and self-assured. Take the car and get away from the city or plan a small year-end vacation in the nature, away from the fireworks. Maybe this tip will sound obvious for some, but if our life partner suffers particularly this situation, at least for New Year’s Eve you should try to reduce his discomfort by spending an evening in the countryside, on the hills or in the mountains, where the celebration with fireworks is much less common than in the big cities. … As a conclusion, we hope that always more municipalities will adopt restriction in the use of fireworks on their territory in order to have less injured people and less traumatized animals.